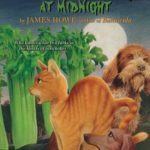 One day, many years after I thought the series was over, I found myself standing in a bookstore staring at the cover of Bunnicula #7: BUNNICULA MEETS EDGAR ALLAN CROW. I couldn’t believe it! 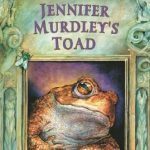 My favorite kids series had another book! Of course I bought it immediately. 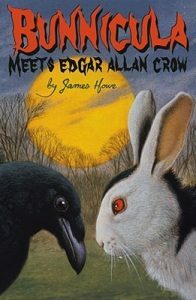 BUNNICULA MEETS EDGAR ALLAN CROW is an odd sort of book. In the beginning it has a much more episodic feeling than as part of a larger story arc. But by the end, you know this is truly the last book in the series. Howe makes that clear. But why? BUNNICULA STRIKES AGAIN had a fine ending. 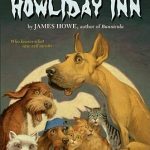 Howie continues his own stories in TALES FROM THE HOUSE OF BUNNICULA, everyone else has a nice wrap up. There was hardly a need for …EDGAR ALLAN CROW. 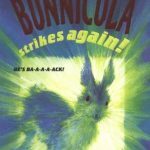 That’s the part that stands out the most about this book, it seems like very much an afterthought rather than a piece of Bunnicula’s story or that of his fellow pets. The book is based around the visit of M.T. Graves, the children’s horror writer. Not to be confused with real world children’s horror author R.L. Stine. Nope, no connection at all. *nervous laughter* But really, it couldn’t be any more obvious, from the moment he was first mentioned back in the early parts of the series we all knew it was Stine. 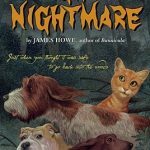 The funniest thing to me about this book is not the suspension of disbelief about the pets or the story, it’s that an author would stay at the home of a contest winner. 10 kinds of awkward for everyone involved. I don’t know, I feel like this book is something totally different. It doesn’t feel like a Bunnicula book. For one, it’s very human focused rather than dealing with the problems of the animals. But for some reason it’s just so different. I can’t put my finger on exactly what, but something separates it from the rest. All in all I’d say read it, it’s a fun story, but don’t expect greatness. It is what it is. What’s your favorite children’s series? Share it in the comments below.